Haunted houses, creepy conservatories, and trick-or-treating, oh my! According to the National Safety Council, parents preparing children for Oct. 31 are encouraged to instruct them on safety procedures. Those still worried about the risks of trick or treating do have options. One such option will be held on OCCC’s campus. The OCCC Halloween carnival is Friday, Oct. 28 from 6 p.m. to 8 p.m. in the general dining area of the Main Building. There are 18 different student organizations sponsoring this event and it is open to the public, said Amy Reynolds, program coordinator for Student Life. The cost per person is one canned good. All cans will be donated to the Regional Food Bank, Reynolds said. “This is a good opportunity for kids to be in a safe environment yet still have a lot of fun,” she said. Jillian Lindblad, Student Life programs coordinator, said there were plenty of activities for children and adults. “There’s face painting, bowling, a DJ and dance floor, all sorts of opportunities to win games and prizes, and tons of candy,” she said. Outside of campus many local churches and community centers offer other safe alternatives. OCCC student Hannah Harris plans on visiting a haunted house. “Not a set up one but an old house that has rumors of actually being haunted,” she said. The Orr Family Farm at 14400 S. Western is another popular destination. They have family friendly activities ranging from hayrides and pumpkin patches, to a corn maze.To find detailed information on activities and attractions at Orr Family Farm visit www.orrfamilyfarm.com. Ghoulish Halloween fun isn’t only for children, there are plenty of events for the post-grade school crowd. Bricktown hosts many Halloween festivities. 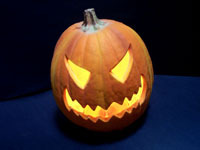 The multiple haunted houses and various museum exhibits offer special Halloween attractions.